Invisible Yellow-Green ink for printing discrete information only visible under a UV light source. 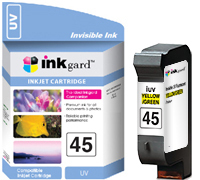 Inkgard inks for HP 45 / TIJ 2.5 cartridges are specifically formulated for high-resolution / high-speed industrial and commercial specialty print applications (SPS). Direct replacements for HP 45, C8842A and 51645A cartridge models.